Cassy blew a collective kiss at them. 'See you in September,' she said. A throwaway line. Just words, uttered casually by a young woman in a hurry. And then she'd gone. It was supposed to be a short trip - a break in New Zealand before her best friend's wedding. But when Cassy waved goodbye to her parents, they never dreamed that it would be years before they'd see her again. Having broken up with her boyfriend, Cassy accepts an invitation to stay in an idyllic farming collective. Overcome by the peace and beauty of the valley and swept up in the charisma of Justin, the community's leader, Cassy becomes convinced that she has to stay. As Cassy becomes more and more entrenched in the group's rituals and beliefs, her frantic parents fight to bring her home - before Justin's prophesied Last Day can come to pass. It's a scenario that plenty of families deal with every day. Teenager's off to spend their gap year travelling in far flung locations - in this case British backpacker Cassy heading to New Zealand with her boyfriend for a short break before returning to her best friend's wedding, study and a normal life. When Cassy gets to New Zealand, however, normality becomes a split with her boyfriend, a chance encounter with some very welcoming people in a van, and years away from home, a life in the midst of a cult in the beautiful, and isolated wilds, of New Zealand. 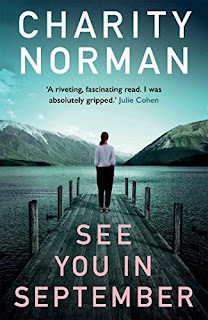 Research about the ways in which people are beguiled into cult life must have been done for SEE YOU IN SEPTEMBER, as the slip into the life is seamless and cleverly done. There are points where the reader is almost as bewitched as Cassy - the lifestyle is gentle, friendly and stress-less. The people are inviting, non-judgemental and seemingly blissfully happy with their living arrangements. It doesn't, initially, even feel like a cult - this is a community that's welcoming, enveloping and then it's controlling and threatening and very discomforting. But by that stage Cassy is embedded and her parents impotent from such a distance, desperate. Vulnerable and controllable, Cassy's exactly the sort of young woman that you'd expect to be pulled into this scenario which makes this slightly less punchy than it should be - that and a tension arc that gets a bit bogged down at points with a tendency to belabour points that are pretty self-evident. 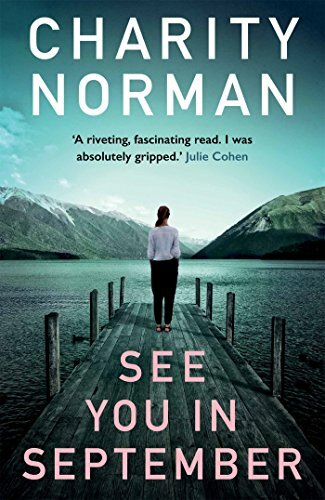 Whilst this detracts a little from the pace and ultimate tension of SEE YOU IN SEPTEMBER, overall the novel makes up for that with a fascinating depiction of a young, vulnerable woman all too suspectible to an ideology of acceptance, the promise of a perfect life, happy to give no thought to the ease with which she might have found it. Karen Chisholm is one of Australia's leading crime reviewers. She created Aust Crime Fiction in 2006, a terrific resource - please check it out. Karen also reviews for Newtown Review of Books, and is a judge of the Ned Kelly Awards and the Ngaio Marsh Awards. She kindly shares some of her reviews of crime and thriller novels from Australian and New Zealand authors on Crime Watch as well as on Aust Crime Fiction. where this review was first published.